Horse Grooming Supplies, Shampoo, Coat Polish! Hair Moisturizer Concentrate: Healthy HairCare Hair Moisturizer for manes, tails and coats is a therapeutic lanolin enriched concentrate that assists in replacing vital oils to the hair and skin. Helps to control dandruff and dry skin. Great for help with blanket rubs, mane and tail itching. You will cut grooming time in half while promoting healthy coats, manes and tails. Spray on after daily grooming, after body clipping, bathing, or on blanket chafed areas. Spray onto tails, manes, coats, soft brush, towel, or massage into hair. Use on a wet or dry horse, clean or dirty. You are going to love the result! • Hair Moisturizer Concentrate: 16 oz. ORDER TODAY! • Hair Moisturizer Concentrate: 32 oz. ORDER TODAY! Mix one part of HAIR MOISTURIZER™ with eight parts of water in a spray bottle. Spray on after daily grooming, after body clipping, bathing, or on blanket chafed areas. Spray onto tails, manes, coats, soft brush, towel, or massage into hair. It's also a great touch-up spray before entering the show ring. Hair Moisturizer Conc 16 oz.aaaaHair Moisturizer Conc 32 oz. EQUINE: Hair Moisturizer, 16 oz. EQUINE: Hair Moisturizer, 32 oz. • Derma Clean Shampoo: Derma Clean Shampoo is a creamy, thick, protein enriched shampoo that gently cleanses manes, tails and hair coat, and helps in preventing many minor skin problems. Perfect in the summer when horses are subject to rain rot and other skin issues. Helps leave the coat shiny, soft, glowing and smelling fresh and clean. Great to use as a deodorizer for dogs too. 16 oz. ORDER NOW! • Herbal Horse Wash: Herbal Horse Wash is an effective, easy to use Spray System Wash & Rinse at the turn of a Switch! The sprayer delivery system draws the herbal horse wash at a preset dilution ratio for a perfect wash every time. Perfectly balanced to clean, protect and condition hair and skin. 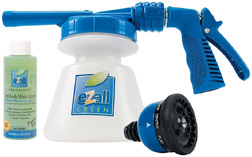 Attach sprayer to garden hose. Snap off shipping tab to allow sprayer to operate. Turn dial to rinse to wet horse. Turn dial to wash to apply Healthy Hair Care Herbal Horse Wash. Herbal Wash is made with Ginseng Root, Alfalfa, Wheat Germ, Licorice, Nettle, Aloe Juice, Soy Protein, and Arnica Montana Flower. Herbal Horse Wash will make your horse deep down clean and shiny in minutes. Wash Bucket & Sponge Not Needed. No Waste, No Mess, Less Work. Herbal Wash 32 oz. and Applicator. (Up to 10 Washes or more per 32 oz.) ORDER NOW! EQUINE: Derma Clean Shampoo, 16 oz. • Silverado Coat Gloss: Silverado Coat Gloss is a ready to use hair polish, spray-on highlighter for the horse's coat, mane and tail. Helps produce the best show ring shine for the coat, mane and tail and repels dust, dirt, grass, and urine, leather, and manure stains. Spray horse's coat, mane and tail, brush or towel into coat. Comb and detangle mane and tail. Mist entire horse, mane, tail and coat lightly again. Groom once, horses stay clean and show ring ready for days. 32 oz. Spray. ORDER NOW! • Silverado Detangler Conditioner: Silverado Detangler is a high grade blend of conditioners, penetrate even the most dry, brittle, tangled manes and tails, leaving them soft, shiny and tangle-free. Enriched with added Sun Block Protection. UV-A & UV-B blockers protect and prevent manes and tails from bleaching & breaking caused by sun damage. Silverado Detangler is concentrated, lasts for days, repels dirt and dust, and controls static. 8 oz. ORDER NOW! EQUINE: Silverado Coat Gloss, 32 oz. EQUINE: Silverado Detangler Conditioner, 8 oz. 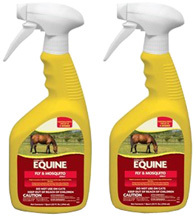 • Equine Fly & Mosquito Ready To Use Spray: Controls pests up to 4 weeks! A water-based ready-to-use spray or wipe-on. For use on horses, ponies, dogs, and dog premises. 2 Pack. ORDER NOW! • Traveler Wound & Skin Care Kit: Vetericyn Wound and Skin Care is intended for the OTC management of skin abrasions, lacerations, minor irritations, cuts and intact skin. This treatment applies to the following species: Caged birds, Cats, Dogs, and Horses. Safe and non-toxic, Safe if licked or ingested. No alcohol, steroids or antibiotics, non-irritating and non-sensitizing. Works on all animal skin types. CAUTION: For external use only. Discontinue use if irritation develops and contact your veterinarian. For animal use only. Not for human use. ORDER NOW! EQUINE: Traveler Wound & Skin Care Kit, 2 pc. • Vets Best Flea & Tick Total Protection Kit: Vet's Best Flea + Tick Total Protection Kit helps kill fleas, flea eggs, and ticks on-contact, while also repelling mosquitoes; safe for dogs and cats 12 weeks or older. Total Protection Kit made with natural ingredients (Peppermint Oil, Clove Extract, Cinnamon Oil, And Thyme While Oil) to leave your pet smelling fresh. Contains no chemical pyrethrins, permethrins, or cedar oil, so it's safe for the whole family. Whether at home or on-the-go, the Flea + Tick Total Protection kit has you and your dog or cat covered. 3 pc. ORDER NOW! -- 1 Anti-Flea Shampoo, 8 oz. -- 1 Home and Go Spray, 6.3 oz. -- 1 Flea + Tick Spot-On, 0.6 oz. 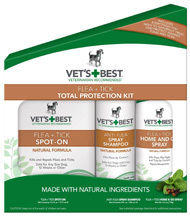 EQUINE: Vets Best Flea & Tick Total Protection Kit, 3 pc. An effective, clean, and invigorating rub that quickly stimulates superficial circulation and reduces soreness resulting from fatigue or strain. Bigeloil, diluted with water, makes a refreshing brace or body wash when applied to tired, overheated animals after strenuous muscular activity. Bigeloil has a pleasant scent and is an inexpensive external analgesic with antiseptic properties. Does not contain green soap. • Bigel Oil®: 16 oz. • Bigel Oil®: 32 oz. • Bigeloil® Liquid Gel (Topical Pain Relieving Gel): Has the same unique Bigeloil formula that acts as a highly effective rub to refresh and invigorate sore muscles, aches, strains, and arthritis . This super convenient fast-acting gel allows controlled application for treating localized pain. Can be used as external antiseptic and analgesic for minor cuts and abrasions. Can use with or without a wrap, absorbs quickly, and leaves no residue. 14 oz. #427947. ORDER NOW! EQUINE: Bigel Oil®, 16 oz. EQUINE: Bigel Oil®, 32 oz. EQUINE: Bigel Liquid GEL, 14 oz. 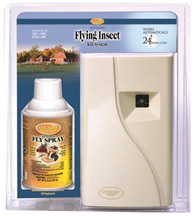 -- 1 Country Vet Fly Spray, 6.4 oz.